I cannot believe it was middle of October the last time I posted on my blog! So many things have been going on that it seems the blog was neglected. Well here's just a little about what has been going on in my life since the last time I posted. 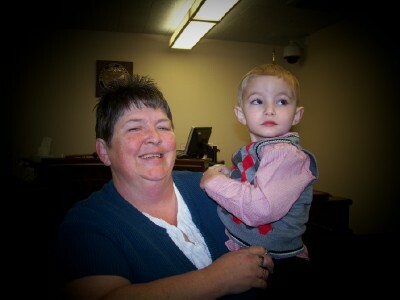 As many of you know I have been raising my grandson since he was 6 months old, he is now 3 1/2 years old. On November 12, 2010 he became my son! It has been a long road but we are on to our new lives as mother and son now. (No more State Child Welfare folks in our lives, no more court appearances, no more lawyers, etc). Here's a picture of us at the courthouse that wonderful day! Now on to some files to share! I hope to have a few more Christmas type files up soon! Oops! This file has been fixed - Thanks for letting me know! Congrats on the adoption of your grand child. That is so wonderful. My first grand child will arrive in March of next year and Im so excited. I just cant wait. Thank you for the super cute files. You have a lucky "son" to have such a caring mother. Thank you for the lovely little deer and plucky snowman. I really appreciate your generosity and I envy your talent. I'm so excited for you! Enjoy every moment with your little man now! Thank you for the files. Awesome files and CONGRATULATIONS!!!!!! That is amazing.....what a WONDERFUL early Christmas present!!!!!!!! Congratulations to both of you. And a big thank you for the files you share with us. Congratulations to both of you!! Thanks for sharing your files with us, I appreciate it. Congratulations on officially becoming a 'Mom". Your files are great. Thank you. From one adopting mom to another, Congratulations! I get behind as well on my blog, but that's because of two boys under 5. Aye. You know how that can be with a little one of your own. Woo-hoo! No more third parties to meddle in your life (I understand). Congrats on your adoption, I also adopted my neice, She was taken away at birth due to Meth use by her bio mom. I went through all the Child and Family services things courts and many others coming into our lives weekly. When the day came that she was ours, and the Judge stated her new name all I could do was cry. That was 12 years ago now and I am still so very happy that she is in my life. I thank God every day for her, I am just so happy for you. You are all so kind! Thanks for the words of encouragement! It is amazing to me how many others are in this same place (or very similiar) as we are. Love to all of you! And thanks for visiting my blog! Enjoy your little one. They grow up so quickly. I tried cutting the little reindeer svg file but it seems as the file isn't complete.You may want to look into it. Thanks for sharing the other files.